U.S. astronomers using the Atacama Large Millimeter / submillimeter Array have captured a remarkable image of a young star, HD 107146, surrounded by a deep layer of dust — a layer that’s thicker on the outside than it is on the inside, suggesting the presence of an entire family of Pluto-like objects. HD 107146 is a yellow main sequence star located in the constellation Coma Berenices, about 90 light-years away. It has a magnitude of about 7 and cannot be seen with the naked eye but is visible through a small telescope. The star is 100 million years old and is of particular interest to astronomers because it is in many ways a younger version of our own Sun. “The dust in HD 107146 reveals this very interesting feature — it gets thicker in the very distant outer reaches of the star’s disk,” said Luca Ricci, an astronomer at the Harvard-Smithsonian Center for Astrophysics (CfA), and lead author on a paper accepted for publication in the Astrophysical Journal. At the time of the observations, Ricci was with the California Institute of Technology. According to current computer models, the observation that the density of dust is higher in the outer regions of the disk can only be explained by the presence of recently formed Pluto-sized bodies. Their gravity would disturb smaller planetesimals, causing more frequent collisions that generate the dust ALMA sees. The new ALMA data also hint at another intriguing feature in the outer reaches of the disk: a possible “dip” or depression in the dust about 746 million miles (1.2 billion km) wide, beginning approximately 2.5 times the distance of the Sun to Neptune from the central star. Though only suggested in these preliminary observations, this depression could be a gap in the disk, which would be indicative of an Earth-mass exoplanet sweeping the area clear of debris. Such a feature would have important implications for the possible planet-like inhabitants of this disk and may suggest that Earth-sized planets could form in an entirely new range of orbits than have ever been seen before. 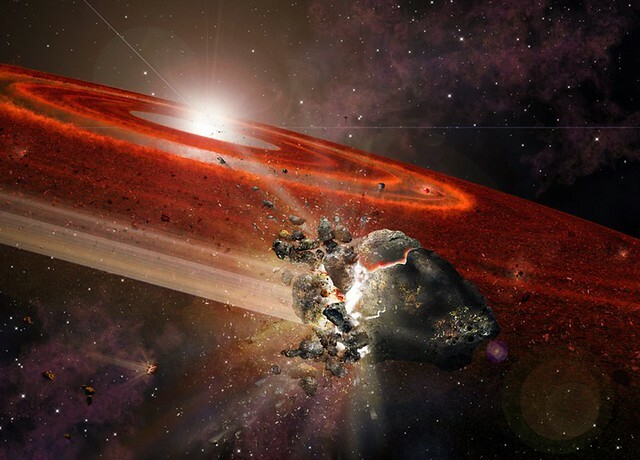 The new observations are significant because HD 107146 is very similar to Earth’s mother star. The star will continue to be studied by astronomers as it’s shedding light on how systems transition from its early life to the final stage when planets are done forming.